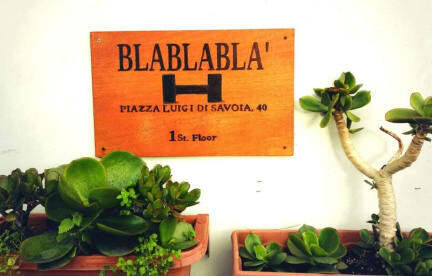 Welcome to our Blablabla Guesthouse! Feel free to enjoy ITALY and Bari with us! SUMUS BLA (Better life Association) is glad to offer comfortable and well-located accomodation to new members and already associated members. By making a reservation, you agree to become a member of the SUMUS BLA ASSOCIATION. There is no inscription fee. Every reservation is completed with a donation, and after your donation you can ask for a regular receipt. Because we are a non profit association, members can write an email to be hosted for a donation in other forms, such as volonteering on our projects. Our guesthouse is a warm and cosy place in the center of Bari, 3 blocks from the railway station and a few blocks from the beautiful Adriatic Sea. We have 4 double/single rooms, dorms (with bunk beds), with shared bathrooms and kitchens. Our private double and single rooms in are in one apartment 400m away. We offer comfort at low cost, with free wifi internet connection. Free coffee and tea are also at your disposal. For your safety, we have security lockers, that are free of charge. Towels and bed sheets are at your disposal, as well. Our kitchen is fully equipped if you want to cook yourself a delicious meal. You will always find olive oil from the region to enjoy, in our kitchen. There is no curfew. There is no way for you to get locked out. After checking in, you get a pair of keys. We are here for you, and if you have any questions, feel free to ask our wonderful staff, who speak Russian, Greek, German, French, Italian, Croatian, Arabic and English. Lugar centrico y agradable, personal muy atento y simpatico, buena atmosfera. Very clean and spacious. Nice staff, always ready to help. Very much worth the budget. It’s not a bad place to stay at! I felt like I was visiting friends and family. The hostel itself is not like a fancy hotel but the home like atmosphere and personable staff made up for it in my opinion. Between the staff and other guests I made connections during my stay that I truly value. I look forward to staying there again if I have the chance. Small but a nice hostel. Is like a house, where the staff lives too. You can feel at home their. Two bathrooms, one on the "balcony" that was cold in the winter. The rooms were very warm. The door of my room did not close very good and was acctualy constantly open. There were no lockers in the room so I needed to bring all my valuables with me at all times wich was not all that fun. It is more like living like a family then it is a hostel so if you're in to that it will be great but for me it was not everything. The bed was really good tho. It was not a bad place to stay! not at all! Instead of the booked womens doorm I was put in a mixed doorm with some staff members. The room was very cold and the beds not really comfortable. I had to leave befor 9 am and there was no one to check out. For one night ok, but not for longer. The hostel was clean. Pros: The staff is very nice and give it a good atmosphere. Kitchen has free coffee and tea, which was much appreciated. Cons: they need to improve in security, since there are no lockers. When you leave, you get charged to leave your backpack in an unlocked closet and even to use the bathroom or Wi-Fi, according to the signs in reception. The worst part was that I got bed bugs there.